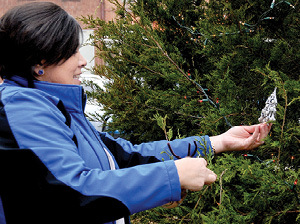 Albany is taking on a Christmas look, and the series of photos in this feature prove just that. 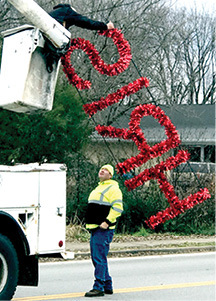 In the top photos, Rick Tallent with Tallent Outdoor Advertising, and Albany City employee Chad Asberry, worked to put the HRIS portion of MERRY CHRISTMAS banner in place On the courthouse square, despite last Friday’s Community Christmas Tree Lighting event being cancelled due to inclement weather, ornaments made by local students were put on the Community Christmas Tree Monday. 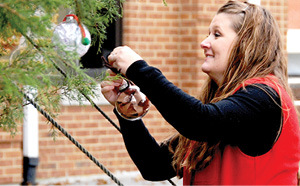 Shown putting the locally made ornaments in place are Christy Nuetzman, Clinton County Extension Agent, and April Speck,above,with the Albany – Clinton County Chamber of Commerce and the Clinton County Tourism Commission. 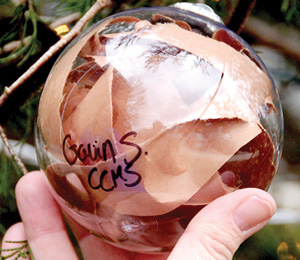 A closeup of one of the student made ornaments is also featured above.